That’s actually the manageable version. Having toys on every conceivable surface (the couch was unusually accessible in that photo, btw, totally misrepresenting its normal uselessness for sitting), makes it difficult to, well, live in the living room (obviously, there is quite a lot of living being done in this room. Just not quiet living. Or living involving adult conversation). So after many months of cleaning up and sorting massive amounts of toys, and feeling more and more like Sisyphus, I decided it was time for an overhaul of our Toy Management Approach. Two things about my take on toys: 1) I’m fairly obsessive focused about keeping toys organized, since my kids play better with them when they are sorted (and since I’m quite type-A). 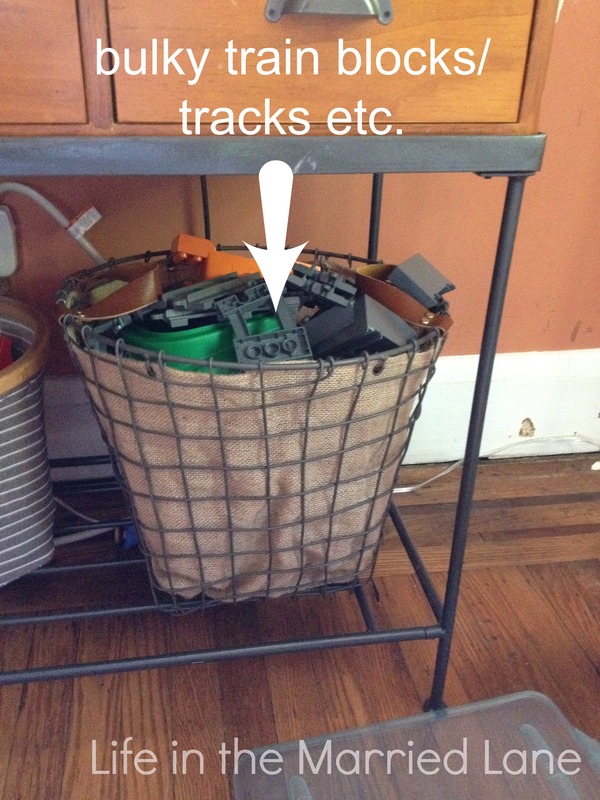 2) I’m working hard to get my kids to clean up after themselves. But when there are so many different toys all mixed up and spread out all over the floor, it’s too much for either me or my kids to deal with. Something had to give. 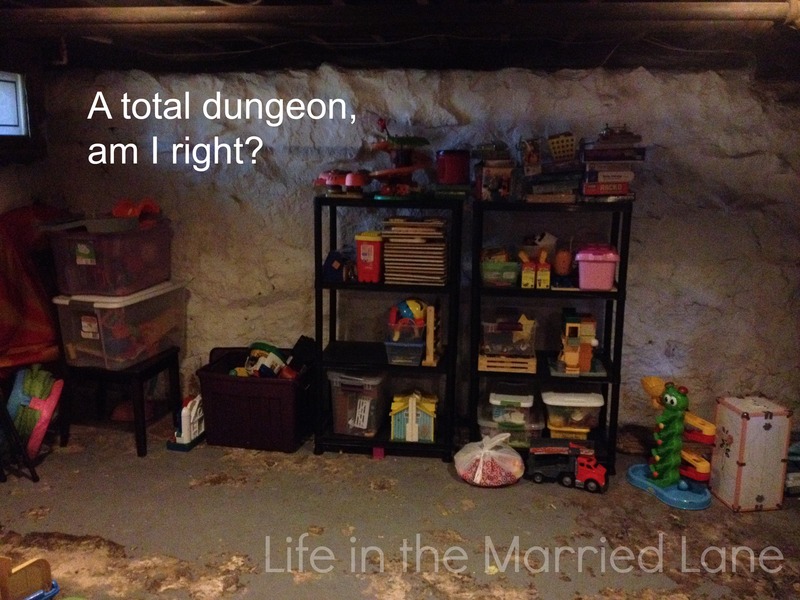 I keep the vast majority of my kids’ toys in the dungeon basement. I got some open shelving from Home Depot, which were extremely easy to assemble, and holds most of our toys (my brother-in-law has these fabulous, tall rubbermaid-ish cabinets that I *really* like, so whenever we’re in the market for a storage upgrade, I’m totally getting those). When the toys are stored in the basement it makes going down to get one a treat. It also makes it somewhat easier to enforce the rule of one up, one down. The main drawback to this (besides the obvious: STAIRS) is that stray pieces which hide from us during picking up accrue and before I know it, I have a whole collection of “toys that really belong downstairs but have been separated from their toy families.” Naturally, I procrastinate putting these where they belong (because STAIRS), so they build up until it’s a whole thing. Before we can bring a new toy up from the basement, we have to put away one toy that’s upstairs. This has been the trickiest rule to enforce, because it takes a lot A LOT of stamina and consistency on my part to make happen. My children don’t exactly clap their hands and say, “oh, yes Mommy, I would love to pick up all the cars/playdough/blocks and put them back in their appropriate container before getting out a new toy!” Not so much. There is often kvetching, sometimes bargaining, occasionally yelling. But after six to nine months of trying to enforce this rule, we’ve actually gotten pretty good at making this the norm. So there is hope. Obviously, everyone has a different threshold of how many toys they can tolerate underfoot. My kids barely touch 3/4 of these toys, so I could realistically pare back even more. 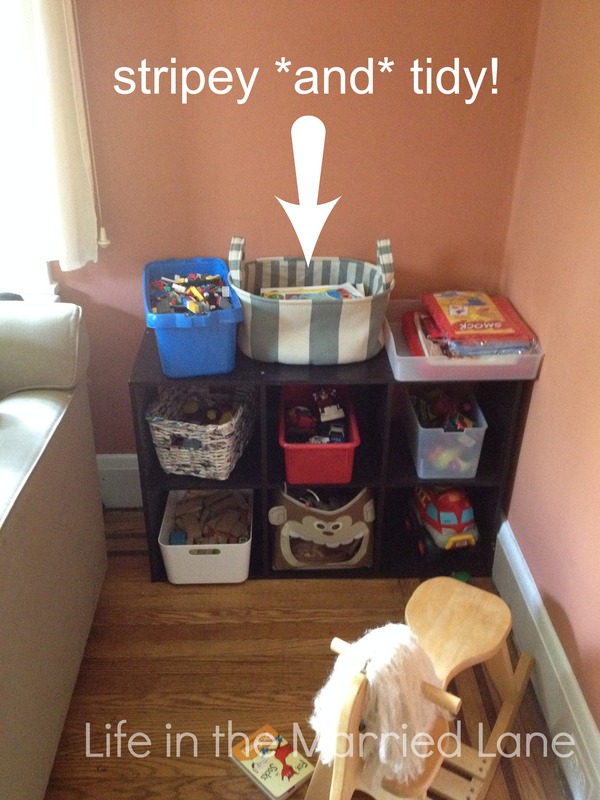 Even though rotation takes effort (STAIRS), it’s fun to randomly switch out which toys stay upstairs, and to see the kids get all excited when they find a “new” toy in rotation. It’s like I went to the store, except the store is the basement and I didn’t have to get in the car or spend any money. This is a constant work in progress. I recently engaged in some retail therapy at Marshall’s and got three new containers (I probably spent a total of $40 on them). The container the duplo blocks were in was literally falling apart, so that had to be upgraded, and I disliked how the bulky duplo train track set (which I got free from someone who was done with it – score!) 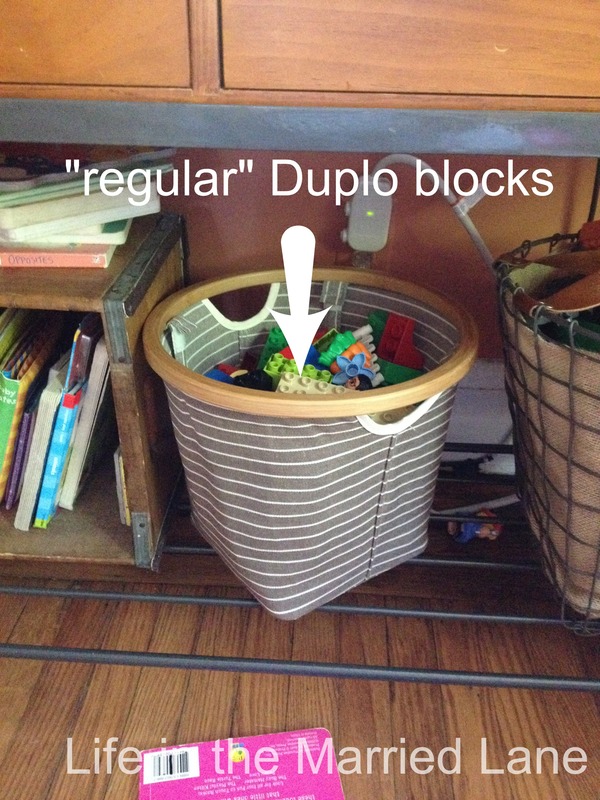 was making the regular duplos impossible to get to without dumping out the entire box. So now I have them neatly separated out. And the other new container I purchased is for the coloring books/construction paper collection that was previously spilling out and getting wedged behind the storage unit. So not only do I feel good about the purchases, I thoroughly enjoy looking at them, and basking in their contributions to my need for neatness. I am constantly tweaking my toy management situation. As my kids get older and become better (thankfully) about taking care of their toys, but as our family continues to grow, it’s been necessary to regularly evaluate what’s working and what isn’t, and not to become too locked in to any one system of organization. This is working for us now, so I’m happy for the time being. I also occasionally choose some toys that aren’t played with so much/aren’t a present from a grandparent/not so appealing anymore and have my children choose some to put in a donation box. Yes, this actually works (and yes, I do “disappear” toys when they’re sleeping/at school as well). I only do this about twice a year, but I love how it’s an opportunity to teach them about giving to others, about appreciating that we have so many toys (though I’m not so sure that message has sunk in yet), and about not being too attached to our stuff. How do you manage your toys? Do they make you crazy, or are you ruling over them with authority? But, like you said, it’s a work in progress. Oh yeah, if they were at your front door, that would certainly be an overwhelming thing to open the door to! I like the idea of a toy closet. Nice! I have vague dreams of finishing the attic and making part of it a playroom, but that’s years and years down the road. I am in an apartment and this is what my place constantly looks like! :-) Great tips though, especially the bring one out only when the other is put back. Even though it takes a fair amount of effort, it has made such a difference in how long I spend picking up! I love this article! 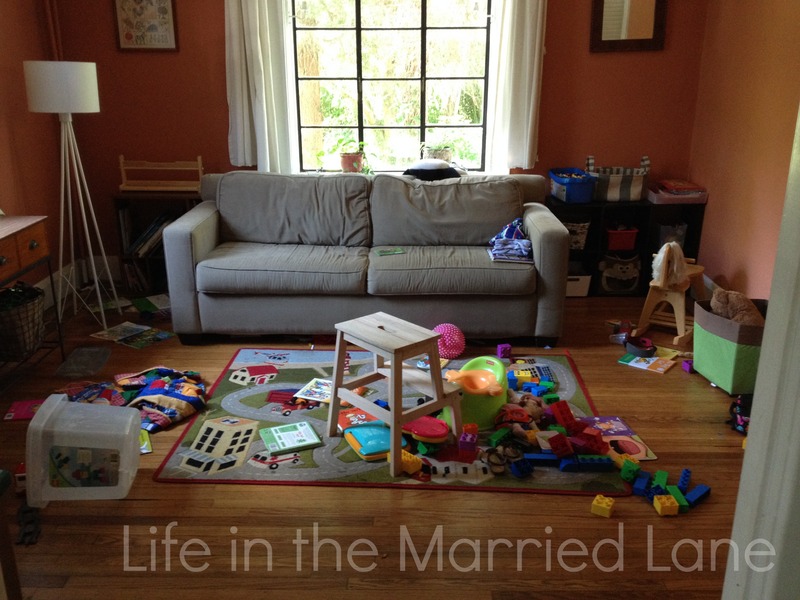 We have a two bedroom apartment, and it can be quite overwhelming with all the toys underfoot. As we don’t have a toy room, I think I need to pare down the amount of toys we have and put some in storage. For the small space we have, I think it is just not manageable to have every toy we own in our apartment. We have a small storage unit (down the hall, through a locked down), and I think the toys are going to be banished there…until please G-d we move to a bigger place (please G-d, someday soon!). Thank you for the inspiration! It is good to learn from you, and also to know we are not alone! Thanks Yehudis! 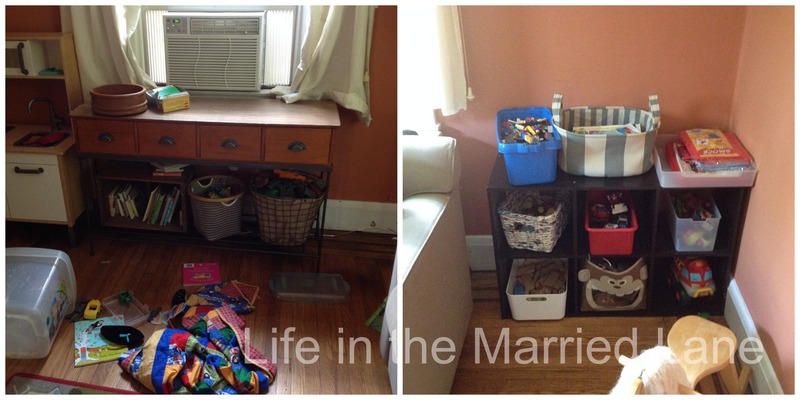 When we were in the apartment, I kept the toys in bins up in the top of the closets, but a storage unit down the hall sounds even better! You are definitely not alone in this challenge!